How Can I Edit Who Assigns a New Hire's Buddy, Manager, etc? 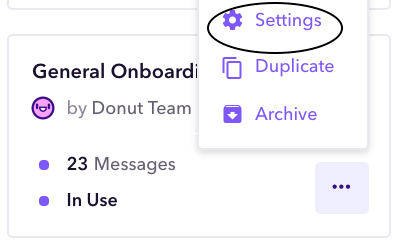 Learn how to edit the default settings on who should select roles (like Buddy, Manager, or Team Lead) when a New Hire is added to Donut. When you add a New Hire to Donut, we'll ask you to select someone to fill empty Roles associated with the New Hire, such as their Buddy or Manager. You can search for specific users to fill roles, or click the ellipses to select another way for that role to be chosen. Click "confirm" to save the role settings. What Happens When I Set Someone Besides Me to Choose a Role? When you select someone (ie a Manager, Specific Person, etc) to choose a Role for a New Hire such as a "Buddy," the Manager or Specific Person will receive a Slack message prompting them to select someone to fill the Role. You can also set the default Role logic for a template so that all New Hires assigned that template will have the same rules (without you having to edit each one individually). Setting the default Role logic saves you time, helps you delegate responsibility to other team members, and automates your onboarding process. Click "Templates" in the left navigation (between "Reporting" and "Roles"), then find the template you'd like to edit. Click the gear icon and select "Settings." Once in the Settings, navigate to the "Roles" tab. You'll see a list of all Roles with options for how each Role should be filled. Note: Changes made in this screen will be applied to all Roles in that template, so all New Hires assigned that template will have the same logic. 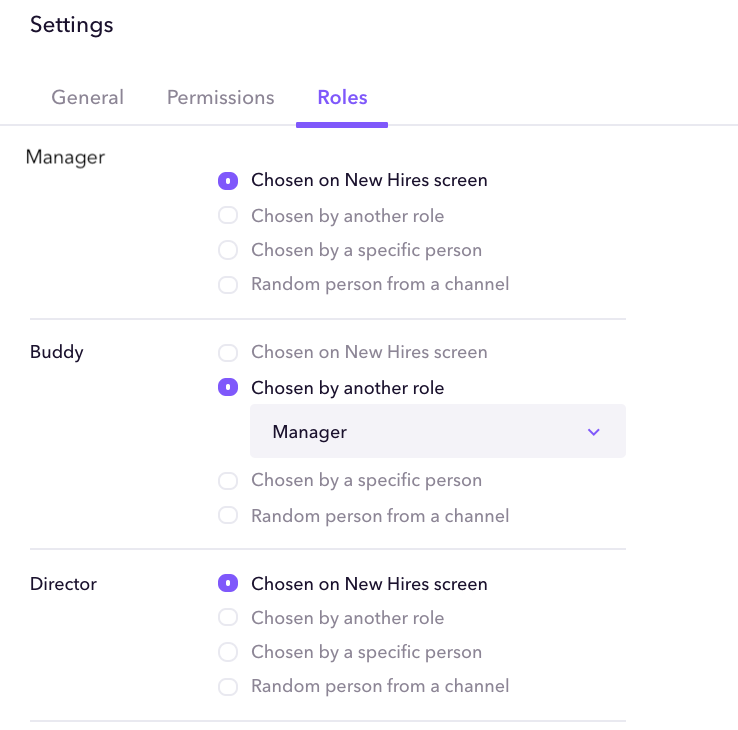 For example, if you edit the Buddy role logic in your "General Onboarding Template" to be "Chosen by another role" and select "Manager," then all New Hires assigned the "General Onboarding Template" will have their Buddy chosen by their Manager. Be sure to hit "Save" once you've updated all Roles.